That money would buy 9 or 10 standard 1GB memory sticks! I can not wait to see how Darlene justifies a 1000% markup! Because of the 1000% rise in your happiness for possessing such an object of beauty that will cheer you as you transfer HK wallpapers onto it to give to your many many friends? That is one computer we won’t have to worry about filling up a landfill. It just could be the first computer people collect. I can see them being sold, ten years later, “in the original package”. This is ridiculous! 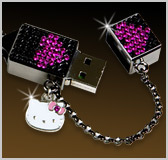 My USB memory stick cost me 10$ CAN… I really don’t see the whole point of putting swarovsky crystal on computers or anywhere else than on jewelry. When will people understand??? Man, that Swarovski stuff is just plain stupid. They put the crystals RIGHT where all the hand-crud is going to scrape off on them, and then knock the crystals off with wear and tear. I’m betting the crystals won’t be very kind to your hand, either. Same issue for the laptop decos….I throw extra stuff in my backpack with my laptop, and those crystals will scratch up and tear stuff! Then they get loose in the backpack and cause other problems. And the USB stick? Pointless, and far too expensive to be worth it. USB sticks get torn up in pockets, and those stupid crystals won’t last more than about five days around me. Plus, the lid crystals will catch and cause the lid to pop off the stick, getting it full of lint and other crap. Talk about the ultimate in impracticality. No one who SERIOUSLY uses their computer would buy these. These are the ultimate in bling junk. Well, I did it. I posted a Hello Kitty Birthday theme at my blog, and listed this site as best site of the day. Scary. If I ever become a millionaire, I’m going to consider buying this. Ah, who am I kidding? I’d never buy this. And I’d probably set fire on someone who likes to spend money in such ridiculous ways. The HK computer and periphs causes interweb diabeetus. where is darlene? did she get saved on this memory stick and is unable to be rebooted? one can only hope! $135 for a 1GB memory stick? What the hell?! And who (besides the nuts at Sanrio) puts those silly little crystals on computer stuff? 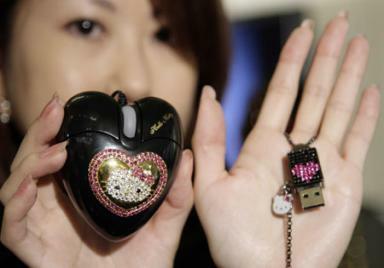 Between the memory stick and the mouse, it’s enought to make anyone with sense want to upchuck. That thing better have encrusted jewels. Otherwise its a complete rip-off. DJ Psychomike – I hav ejsut looked at your site. The ‘Daft’ Vader HK combo – ha ha ha. Says she the owner of some HK items and decided to see the Star Wars movies ‘in order’ and have V and VI still to go! Thanks Wendyscat. That pic has been around the web awhile but still cracks me up. Putting together a Hello Kitty Birthday page was a good antidote to the empire of HK. She actually liked the last few Star Wars movies? Ugh. ew! and i’m a fan! i do have a memory stick tho. very simple. it’s white with a pink cap that has a tiny plastic jewel on it. the bling out HK face came off b/c of being knocked around in my purse, but the name is still on there. it’s cute. it’s simple. THAT is NOT! oh my god!!!! please tell me where I can buy the scooter and the laptop computer because i refuse to by any other computer. Tis is a serious inquiry about purchasing these products!!! I have given up the “Chanel” for Hello Kitty!!!! … Holy crap, Darlene DIDN’T leave a comment damning you to hell?! I had the URL sent to me. Upon every entry I’m just rolling on the floor! It’s good therapy too, to counteract HK’s attacks at home.